As energy insiders gathered in Chicago last week at Microgrid 2018, three events unfolded that signal how microgrid growth may take shape in the coming months and years. The first is the accession of microgrid champion Anne Pramaggiore to CEO of Exelon Utilities, one of the largest utilities in the US. The second was an entrance of an oil major — the first we believe — into the microgrid market. 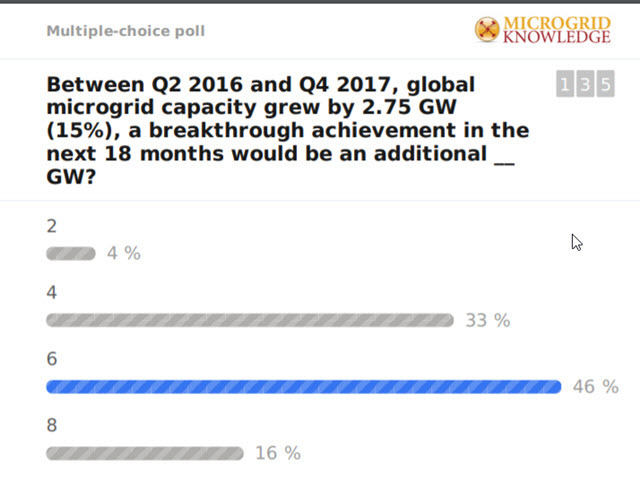 And the third was the exceptional bullishness about microgrid growth evidenced in a Microgrid 2018 poll. “These three things, when taken together, represent a pretty strong statement about what’s happening — and the health in the industry,” said David Chiesa, S&C Electric‘s senior director for global business development. As president and CEO of Commonwealth Edison since 2012, Pramaggiore has turned on its head the stereotype that utilities fear change, marking her tenure with an innovative grid modernization program and a first-in-the-nation utility microgrid cluster. Winning support for the microgrid was a multi-year endeavor which ComEd first attempted before the state legislature and later before the Illinois Commerce Commission (ICC). Many deemed the project dead last year when several key stakeholders came out in opposition. However, ComEd persistently negotiated, addressing the concerns one by one of each organization, among them the Environmental Defense Fund and Citizens Utility Board. The Illinois Attorney General continued its opposition. But an administrative law judge signaled support, and project won ICC approval. 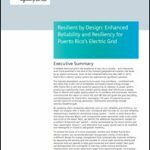 The win was particularly significant because it offered a template for other utilities struggling to find a regulatory path to approval for microgrid projects, among them other Exelon utilities. 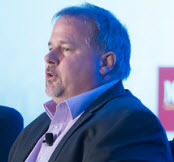 Now with Pramaggiore at the helm, microgrid insiders are hopeful that the big ship, Exelon Utilities, will move more quickly into microgrids with others in the industry able to take advantage of its wake. “It’s a great referendum on the industry that change is coming and that exceptional leaders can talk about that change openly – and it helps their careers,” Chiesa said. At first glance big oil and small microgrids may seem like an unlikely pairing, but oil has money to invest, and it’s on the lookout for opportunity, as evidenced by the billions oil companies have invested in renewables. BP and Shell also have been investing in electric vehicle charging. 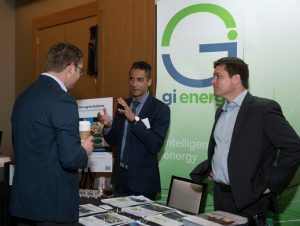 Now Shell is investing in microgrid and distributed energy with the acquisition of a majority interest of GI Energy, announced last week at Microgrid 2018. “The acquisition of our company by Shell tells you that the big capital players are starting to look at this sector very seriously. 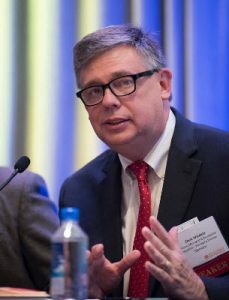 I think that is going to have a big impact on the market,” said Thomas Chadwick, GI Energy CEO, speaking last week on a panel at Microgrid 2018. The oil major made the acquisition through Shell New Energies, a business it launched in 2016 to explore commercial models that support the world’s energy transition. 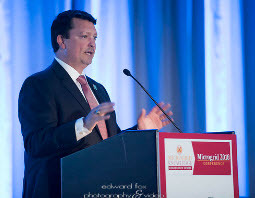 Chiesa described the acquisition as “a sure sign that maturity is coming” to the microgrid industry. “You can go back and look at solar and wind and see how consolidation transformed those industries, as well,” he noted. “We saw the microgrid controller companies start to consolidate and now we are starting to see the development companies get absorbed by some of the largest energy companies in the world. H.G. Chissell, the master of ceremonies at Microgrid 2018, conducted a series of instant polls to gauge audience opinion on a range of topics. One was an attention grabber. Nearly half (46 percent) believe that microgrid growth can double over the next 18 months, which would mean adding 6 GW of capacity, a large feat for a small industry. Some industry experts saw the audience bullishness as a logical extension of market activity. Mark Feasel, Schneider Electric’s vice president of utility and smart grids, sees the right forces in place for rapid microgrid growth. But there are forces getting in the way too, he said. “In an environment unimpeded by government interference, the rise of the prosumer is directly correlated to the acceleration of digitization – an informed and empowered energy consumer embraces action. The North American regulatory landscape is not free of impediment but enough of the ingredients are in place to justify rapid growth of microgrid,” Feasel said. Veolia North America’s Johanna Ghabour also noted hurdles to microgrid growth. S&C’s Chiesa was more skeptical about reaching 6 GW that quickly. Track news about microgrid growth. Subscribe to the free Microgrid Knowledge newsletter.